Before the ice ages started (when CO2 dropped below today's levels) the climate was a lot more stable. I am not talking about extreme CO2 levels, just a 100, at most 200ppm more. skeptic123 @428, last and most offensive first! The GISP2 ice core data represents a regional record only, not a global record. Are you seriously trying to suggest that global temperatures vary as rapidly as do regional temperatures (and regional temperatures with one of the most rapid rates of change of temperature found on the planet)? Further, are you seriously trying to suggest that the magnitude of temperature change from a regional record is also to be found in the global record? If so, you have largely disqualified yourself from the conversation on the basis of complete ignorance of basic relevant facts. If not, you have certainly disqualified yourself from the conversation on the basis of deliberately presenting evidence in a form you know to be misleading. Individual proxies show rapid variation in temperature of considerable amplitude. Of those, GISP2 (light blue) shows the greatest variation, having the highest peak holocene temperature anomaly, and the lowest most recent temperature anomaly. Because peaks in various records rarely coincide, and some records are always out of phase with others (ie, have troughs where the others have peaks), the arithmetic mean of all 8 proxies shows both much less absolute temperature variation, and much lower rates of temperature change than do individual proxies. 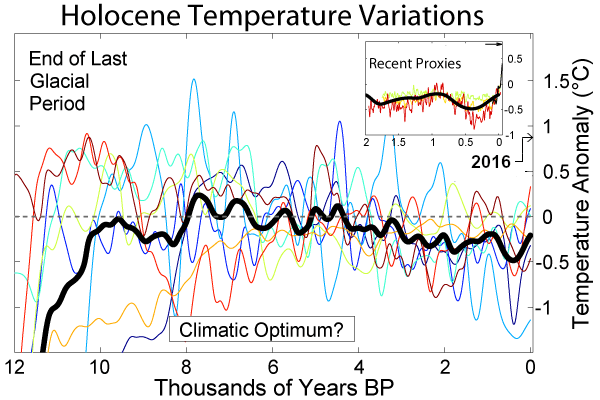 Consequently, presenting a single proxy (let alone the most variable proxy) as representative of either absolute magnitude of global temperature change or of rates of temperature change over the holocene is fundamentally misleading (whether from ignorance of the effects of regression to the mean, or intent to decieve). The same basic problems afflict the Vostock proxy record (blue in the above graph). The absolute temperature magnitude shown in the Vostock record is approximately twice the absolute variation in the global record. Further, periods of rapid decline rarely coincide with other regional proxies so that periods of rapid decline in the Vostock record will coincide with much slower decline (or sometimes even increases) in a global record. Further, your quote from the caption of the Vostock graph that you show is misleading out of context, and not supported by the evidence in any event. While there are some very rapid short duration changes, they are seen to quickly reverse themselves. The result is that changes over a century or more are at rates of -1C per century or less. Typically much less. As the transition from inter-glacial to glacial in the Vostock record requires a temperature change of approximately -6C, that means transitions from interglacial to glacial cannot occure in less than 500 years or more. Indeed, based on a pixel count of the graph of the vostock record, the most rapid interglacial to glacial transition (taken as the interval between 0C and the bottom of the first trough below -4C, or to -6 C, which ever is shorter) takes 6250 years (approx 240 thousand years ago). The next most rapid, and most recent took thirteen thousand years. Finally, the TAR quote references Alley 93, which analysed early icecore data from Greenland. The rapid transition it found was the Younger Dryas, which was primarilly a North Atlantic phenomenon, and which involved much slower transitions in temperature when averaged across a number of diverse locations. (In 1993, only Greenland proxies were available back so far in time.) It is, therefore, obsolete, having been disproved by more recent data. skeptic123 @452 - In fact climate models predict more abrupt temperature changes as a result of volcanic activity than actually occur. Your claim, therefore, is the exact reverse of the truth. @453 As I have just shown, changes from interglacial to glacial are relatively gradual, with the most rapid representing a mean rate of temperature change at Vostock of less than 0.01 C per decade, ie, a tenth of the rate of the current trend (which the AGW deniers insist on calling a pause). Transitions from glacial to interglacial are typically much more rapid, and projected temperature increases over the coming century being much more rapid again, with the equivalent temperature increase to that between interglacial and glacial within 200 years on the outside (with BAU). @454 Actually, the transition from glacial to interglacial typically occurs with CO2 concentrations 20-40 ppmv below preindustrial levels. No such transition has ever occurred with CO2 concentrations at modern values. @456, 453 - ok, so where do the statements from IPCC and GRIDA about rapid glaciations in a matter of few decades come from? @445, So you are promoting geo-engineering of the planet? skeptic123 @457, if you only presented GISP2 as an example of an unsmoothed record, you deliberately presented an irrelevant example in that Marcot et al is not a smooth of the GISP2 record. A 2-3 C drop on global temperature over a century or two would indeed be no fun at all. However, the likelihood of such an event with 280 ppmv of atmospheric CO2 is very low. We know this because only three events in the holocene come close to such a situation. The largest of these, the 8.2 kiloyear event was the result of a sudden spike in sea level resulting from the release of damned melt water durring the melting of the laurentide ice sheet. That cause is not applicable for stable preindustrial conditions or indeed at anytime except following the end of a glacial. The 5.9 kiloyear event and the 4.2 kiloyear event where much smaller and preceded the rise of CO2 concentrations to 280 ppmv. The most recent similar event was the Little Ice Age, with global temperatures declining by just 0.2 to 0.4 C.
With respect to the LIA, if that is the sort of unexpected climate variability we have to worry about, you need to make the difficulty argument that a low risk of a 0.3 C decline in global temperature is more threatening than a very high probability of a 3-5 C rise in global temperature. You also need the face the fact that these events seem to have a period of about 1500 +/- 500 years, and with the most recent event starting less than 500 years ago, the next event cannot be expected for at least another 500 years. In short, it is absolute folly to not intervene to prevent an almost certain, large and very rapid event starting now because of the low risk of a small, relatively slow event that may occur 500-2000 years from now. Yet that folly is the basis of your argument. @ 447, the counter to this is that California isn't a global indicator no matter what those guys handing out cds on the boulevarde say ! @456, 454 - so, why did the ice ages epoch start in the first place then, CO2 concentrations before it started were above current levels. It is of course possible that the CO2 got sucked somewhere first, but do we know of such an event. A bit of light reading for you. While the conclusions from such studies as presented within the linked document remain incomplete, knowledge of what is under examination may stop painfully simplistic assertons about CO2 levels and the causes of glaciation. "These preconditions—moisture plus an Arctic nucleus for cooling—would have made the climate system highly susceptible to ice sheet growth. Even modest changes in the global environment would have been sufficient to tip the scales and lead to the onset of major Northern Hemisphere glaciation. Just such a change occurred between 3.1 and 2.5 million years ago, as Earth’s axis fluctuated so that the planet’s tilt toward the sun was less than today’s angle of 23.45 degrees." So, what's stopping the same thing happening today, I mean not due to an axis tilt but for example due to a major volcanic eruption or decline in solar activity, the other conditions seem to be the same. You write "So, according to the article the ice ages started at levels of CO2 close to today's..."
Where exactly does the article make this assertion? @469, it doesn't directly, however it states that the reason for the glaciation were atmospheric and oceanic conditions plus a tilt in the Earth's axis, it doesn't say anything about a sudden drop in CO2 and we know that 3 million years ago CO2 concentrations were the same as today's, so. "Scientists believe that the most recent period with a 400 ppm level of carbon dioxide in the atmosphere was the Pliocene, between five million and three million years ago, according to the Scripps Institution of Oceanography, which keeps track of the Keeling Curve." Advocating increasing C02 to prevent a future ice age sounds like someone saying "Let's burn our house down today to prevent the possibility of flooding due to rising sea levels next year." skeptic1223 - As numerous posters have pointed out, there is really no evidence supporting a risk of sudden glaciation right now. The ice age cycles have in the past been driven by Milankovitch forcings, orbital changes, episodes like the Younger Dryas cooling event were as far as we can tell due to conditions (giant ice dams releasing) that simply don't exist today, and were regional, not global. Our emissions have essentially removed any chance of a glaciation for the next Milankovitch cycle - we're just not at risk of an ice age. On the other hand, the warming we've already committed to points toward mass extinctions (as climate change exceeds the speed of species movement to keep up with their environments), considerable impacts on agriculture, disease, weather, and many many other impacts. You've presented no evidence whatsoever supporting your hypothesis, and therefore your suggestion that we need another 100-200ppm of CO2 is just absurd. There's no risk of sudden cooling, and multiplying the impacts of warming seems just foolish. "It doesn't directly," you write. Indeed it doesn't make that assertion at all. Now you are asserting that "we know that 3 million years ago CO2 concentrations were the same as today's." You provide a quote from a livescience blog but is your assertion supported by this livescience blog? The answer is "no". 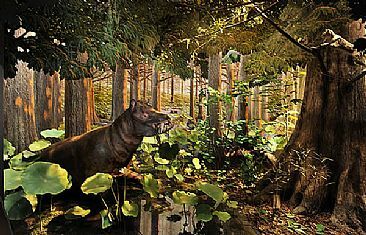 If you could be bothered to examine the Scripps posting referenced by your livescience blog, you will see that it talks of "The Pliocene is the geologic era between five million and three million years ago. ... It is trickier to estimate carbon dioxide levels before then(800kybp), but in 2009, one research team reported finding evidence of carbon dioxide levels ranging between 365 and 415 ppm roughly 4.5 million years ago." So this citation is actually a little early for our purpose and the range of CO2 level has mostly been left behind by today's anthropogenic emissions. Perhaps you can find some support for your assertion elsewhere. But then do bear in mind the actual age we are interested in is the point that Arctic glaciation kicked off which I believe was 2.7Mybp. No matter how many times you repeat the quote, the data does not support it. Further, science proceeds by evidence, not by out of context quotation (which is rather the mark of pseudoscience). Now, it is possible that the scientists who made that claim define an "ice age" as any period with a temperature anomaly less than x, where x is -0.5, or -0.1, or some other arbitrary value. It is also possible that they consider temperatures of x + 0.5 C as "a warm climate". In that case, what they say is true, trivial, and so vague without the specification that that is how they interpret their words, and a specification of x as to be useless. If you want to use the quote, it is therefore incumbent on you to find out the exact interpretation the authors give to the words. Absent that effort, however, it remains that the data directly contradicts the claim supposedly based upon it. So, if you are not prepared to make the effort to provide the context of the quote on whose authority you rest, it is incumbent on you to follow the data. Failure to do so simply demonstrates that you accept data only if you think it supports your position. Worse, it shows that you present data that in fact falsifies your position as supporting it, and refuse to acknowledge the detailed examination that shows that the data refutes your position. Again, those are the hallmarks of pseudoscience. Long experience has shown that debating with pseudoscientists is completely unprofitable in that their positions are not based on reason and evidence, and therefore cannot be altered by either reason or evidence. I also think that the complete divorce of your opinions from actual data is sufficiently evident to any interested readers that I do not need to spell it out again. Consequently I will ignore your responses in future until such time that you start correcting your position based in the actual data. [JH] Your above comment is actually directed at skeptic1223. skeptic1223's over-enthusiasm for linking present-day CO2 levels to some threashold CO2 level which allowed the era of ice-ages to kick off appears to have run its course. Yet he did present one aspect of climate that seldom gets discussed. skeptic1223 began his input way up @420 with the observation that orbital forcing had become a bigger feature of climate since the inception of the Arctic glaciation by creating higher ampitude oscillations in the global temperature record. The graphic below (derived from Lisiecki & Raymo (2005) Fig 4) was presented @423 by way of illustration. Such apparent increases in ampitude do support the idea of an increase in climate sensitivity in some manner as in the long run orbital forcing cycles are constant in size. Such forcing is large at specific latitudes while small globally. To suggest this increased ampitude (and thus increased sensitivity) is somehow a function of CO2 levels is of course wrong. But it does beg the question - why doesn't this increased ampitude in oscillation make ECS vary with temperature/Arctic glaciation? My view of this is that to calculate the sensitivity of climate to orbital forcing from what appears a hysteresis loop could be used to show big sensitivity changes but these would not be very helpful for our purpose of finding ECS under AGW. Thus the slow feedbacks of albedo, CO2, methane, etc. are considered as forcings rather than feedbacks to allow a meaningful ECS to be calculated. "Astronomical (orbital) forcing is a key driver of climate change. In global annual mean calculations of radiative change, astronomical forcing is very small and often ignored. Although this obscures its importance, mainly concerning seasonal changes in the spatial distribution of insolation over the planet, we propose that the contribution of the astronomical forcing to (the climate forcing) may be neglected initially. When other components of the system respond to the seasonal aspects of forcing, such as Quaternary ice-sheet variations, these may be accounted for as forcings themselves." This accounting of slow feedbacks as forcings is a reason for ECS only accounting for fast feedbacks. there are many learned fellows on this site much more educated about this issue than a layman like me.. But there are some basic issues that I have an "issue" with (and let's face it unless laymen like me are convinced either way there won't be any action anywhere. It's great to see all the point scoring and technical data etc.. But (I am in the skeptical camp for now).. There are some irrefutable facts .. Things are heating up.. And.. It's happened many times before. There are also a lot of emotional stuff being thrown around. Things have heated before.. scary camp say "yes but this time it's much faster" there is absolutely no way to prove this as we are only talking about less than a 200 years.. And many many times we can see shifts from hot to cold millions perhaps billions of years ago.. But no way we can prove the speed of that heating or cooling within only 100 years or so. Perhaps it is a rapid increase that then wane off .. A natural occurrence .. Can we really do something about it.. Unlikely.. Even if we could .. How? We can't stop the entire world from its day to day use in the next 10 years .. Let alone in the next 100.. So it is what it is. Between humans, volcanoes.. Farting sheep and cows, Position to the sun and how many plants grow at any given time on the planet.. It's probably fair to say whatever is about to happen .. Will happen anyway..
even IF.. Humans were totally responsible (which simply .. We aren't) there is no way.. No way at all .. ever.. You will be able to stop 8 billion people doing whatever they are doing. so let's agree it's happening.. It's happened before slower or faster ..it will still happen .. Wether due to us or nature and universe or all of the above .. we can't stop it no matter what! Let's just ride it out the best we can. [Rob P] - See the No.1 climate myth on Skeptical Science - Climate's changed before. RoamerNZ, if, as you say, you are a layperson, why would you trust your own interpretation of the facts more than you'd trust the interpretations of those who spend their lives reading and performing climate science? Why would you assume that your commentary contains insight that they haven't examined themselves? When you say 'there is absolutely no way to prove this', are you informing climate scientists of something? Have you read, and understood, many paleoclimatology papers? Why do you think we don't understand what causes the planet to warm and cool? It's not just a mysterious variable that wiggles up and down every so often. Climate has physical causes and physicial constraints. Our expectation that the world will keep warming is not because we look at the wiggle and say 'It's gonna keep wiggling up', it's because, physically speaking, it is actually impossible for the world to not keep warming, given current conditions. You have forgotten that as little as 5 years ago the deniers consistently said that it was not warming. It is only when warming became obvious to everyone that they have shifted their argument to "it has warmed before". In addition to Tristans points, you need to consider that the currrent warming was predicted 120 years ago by Arhennius. How could this rapid warming be natural when it was predicted decades in advance? The globe was actually cooling when Arhennius predicted warming and correctly estimated the amount of warming we would get. Try to inform yourself about the data. When you do not know what the facts are it is easy to be confused. Have you ever heard of joining issues? It means you are dealing with a complex system you are defeated by !! Luckily there are other people to take care of you!!! Tristan .. I did not say they were my interpretations.. It is an opinion formed after listening to climatologist. Yes some are of a different persuasion than the one you proclaim., And they are compelling. Each of us must form our own opinion there is no "carte Blanche" to be filled with your version. i also did did not say anything about you or any one else not knowing why.the heating is taking place. What I am not buying into is that we are solely responsible especially in the light that this happens over and over on this planet long before the blink of an eyelid that we have been here. i would also never presume or assume to give insight to any true scientist.. I was merely expressing an opinion.. Based on what I believe to be plausible and for you this is a problem as I am not convinced otherwise. Because of the wiggle.. We are heating up.. But you seem to say because of the current conditions the planet cannot do anything but.. I presume by conditions you mean human activity. And you can categorically guarantee that if all human co2 emissions stopped today .. The heating up would stop permanently? I find that impossible to believe knowing what we know of earth and her idiosyncratic movements. It's akin to saying if humans stop moving around ..the magnetic polar shift won't happen again. Michael.. Sure, deniers at the time did not see the warming as alarmingly large.. Since they now have irrefutable evidence it is heating.. The question then came.. Why? And this is where argument is. (Btw the deniers aren't necessarily the same people). And what is wrong with the argument .. It's happened before? .. It has.. Many times! so you see some one is predicting cooling when it is now warming.. Opposite to your point. But as bozza would say.. These are joining issues and the warming is the precursor for cooling even the possibility of a "snowball" earth.. as it once was and may happen again Have you informed yourself about this data? [JH] Personal opinion carries very little weight on this site. Please provide appropriate scientific documentation of your assertions in your future posts. You seem to be trying to advance the idea that people seeking to determine who to believe regarding the likely impacts of antrhopogenic influences on the atmosphere just cannot figure it out because a) climate changes on various timescales for varioius reasons, and b) one can find experts and supposed experts that disagree on causes and whether warming or cooling is more likely. This information above addresses well a). On b), simply put, you simply need to have apropriate descretion to weed out quacks. Wikipedia nots that Abdussamatov, who you apparantly give as an example of why we just can't determine whether we will warm or cool in the future,"holds that Earth's atmosphere does not produce a greenhouse effect." RoamerNZ, I find your post rather offensive. You confessed earlier having limited knowledge and understanding of the subject at hand, yet you address pretty much all contributors here with such thing as "have you informed yourself about this data?" without specifying what such data is or providing any useable reference. People participating to this forum are usually very well informed about climate science. Many of the contributors/moderators here have published papers in reputable journals. Since you are, by your own admission, the one rather less informed about the whole field, your condescending tone is unwarranted. "But for every yay sayer there is an opposite." The various consensus studies so far indicate that, in fact, the "opposites" are outnumbered by approximately 97 to 3. There are more appropriate threads to discuss this, if you want to provide credible evidence to the contrary. This part here: "In fact earth cooled a whopping 4 degrees from 1450 to 1850 in fact earth has warmed up to 4 degrees 4 times in the last 450 thousand years a fairly regular cycle at that of about 100 thousand years.. We enter the fifth cycle now" That requires some serious backing by real scientific work, the kind published in well established science journals. I'm waiting to see it before taking it seriously. If it is an attempt to refer to the alternance of glacial/interglacial periods, the subject is well studied, consistent with the consensus model of Earth climate, and you should go to the appropriate threads. "It's all to do with Jupiter apparently." This was one the very first pieces of nonsense that I personally debunked on SkS during the early years of the site. Some cited also Mars, and even Pluto, which took us to the height of stupidity. It is complete nonsense. But by all means, cite scientific evidence on the proper thread if you have any. On SkS, you don't get to make up stuff or equate opinion with evidence. The preponderance of scientific evidence is what is considered. It takes some work to determine in which direction that points, but it's worth doing that work, because that is most likely where reality resides. If you're unwilling to do that work, you essentially give up and rationalize your choice of opinion with unfounded ideas of competing theories and competing experts of equal value, which couldn't be farther from reality. Not everything is a matter of opinion, especially in the physical world. This explains the climate changes in our county, i remember in my childhood weather was very predictable in seasons but nowadays this has changed completely. Roamernz - Previous causes are not relevant because they are not the cause today. Yes it has happened before. When it has happened slowly, life adjusted. When it has happened quickly, it was an extinction event. Now it is happening quickly yet there are no natural causes that anyone can find that are emitting CO2 above their historical normal levels. There are no Deccan Traps being created. There are no Siberian Traps to be found. Volcanoes continue to emit around 1% of the CO2 that human are currently emitting via the burning of fossil fuels. No increase in solar radiation has been detected, the solar cycle is sticking to its regular pattern. Cosmic ray collisions in the upper atmosphere have not increased. Climate change?In human terms and gong by conditions on this planet , our place is getting warmer and drier .Species are disapperaring by the day and very quickly going extinct as a result.While some humans will make it through desert conditions , the majority will disappear. It may have to take the genius of a genetic engineer to produce our successor . Humans are pretty smart and some will live to tell the tale. Scientifically, we are facing unprecidented and some man made microcosmic changes in an already hostile environment .Up to now it is not obvious how much time we have for life on earth .We need to consult on how much time the energy or plasma from the sun will last , how many magnetic cycles it will take earth before the atmosphere starts to dissipate like happened on mars, what our chances are for a second life assuming we can beat cosmic radiation effects. Anyway we need to deal with many factors just looking at climate change .Details are welcome. Andreya @486, with AGW, conditions on planet Earth are on average getting wetter, not drier. This is complicated by the fact that the Hadley Cells are extending to higher latitudes resulting in the band of dry descending air at the zone between the Hadle and Ferrel Cells to also move to higher latitudes, drying those areas previously under the Ferrel Cell but now under that zone of dry descending air. It is further complicated by greater evaporation, which means that dry spells will more rapidly result in drought conditions. The net effect of this is that agriculture is likely to be disrupted in many locations, but we will not experience anything like universal desert conditions. In fact, the political disruption caused by uncertain food supplies is likely to be more dangerous to humans than the uncertain food supplies itself. And those uncertain food supplies are as likely to be from conditions becoming too wet, or too warm for traditional crops as from their becoming too dry (and will mostly come from year to year variation being less predictable making adaption of agriculture very difficult). Apart from the top end risks of that political disruption (ie, nuclear war), there is no risk of AGW making humans extinct. Finally, there is zero risk from AGW of the Earth's atmosphere becoming as thin as that of Mars, or in fact varying noticably from its current thickness. Risks on that score are only possible from massive repeated planetary bombardment by infalling meteors (so unlikely as to not be meaningfully expressible as a risk factor); or eventually the gradual warming or possibly the expansion of Sun over time (for which it is not a threat for billions of years). AGW is a grave risk for which we should immediately take suitable measures of mitigation. It is not armageddon. Its purpose is to demonstrate the correlation between past climates and insolation changes, which is why it shows precession, obliquity and eccentricity. But these orbital factors only kick off each period of heating, it's clear that CO2 does most of the work in raising temperatures, and it is the correlation between CO2 and temperatue in the diagram which is what interests me. Anthopogenic CO2 is now 40% above pre-industrial levels (280 ppm up to 400 ppm) so does that mean we already have 10C locked in for the polar regions? "Climate forcing in the LGM equilibrium state due to the slow-feedback ice age surface properties, i.e., increased ice area, different vegetation distribution, and continental shelf exposure, was -3.5 ± 1 W/m2relative to the Holocene. Additional forcing due to reduced amounts of long-lived GHGs (CO2, CH4, N2O), including the indirect effects of CH4 on tropospheric ozone and stratospheric water vapor (fig. S1) was -3 ± 0.5 W/m2. Global forcing due to slight changes in the Earth’s orbit is a negligible fraction of 1 W/m2(fig. S2). The total 6.5 W/m2forcing and global surface temperature change of 5 ± 1°C relative to the Holocene yield an empirical sensitivity ~¾ ± ¼ °C per W/m2forcing, i.e., a Charney sensitivity of 3 ± 1 °C for the 4 W/m2forcing of doubled CO2. This empirical fast-feedback climate sensitivity allows water vapor, clouds, aerosols, sea ice, and all other fast feedbacks that exist in the real world to respond naturally to global climate change." 6.5 W/m^2 is the equivalent to the forcing of a 3.4-fold increase in CO2 concentration. In otherwords, we should expect a 10 C increase in Antarctic temperatures with an increase of CO2 from 280 ppmv to 952 ppmv. That, of course, is just the Equilibrium Climate Sensitivity (ECS) which does not include the impacts of long term feedbacks such as the melting of ice sheets. Including those will result in higher temperatures, but only after the course of many centuries. What is more, if we are sensible and end all CO2 emissions, CO2 concentrations will fall significantly so that we will never experience the Earth System response to the peak CO2 levels. Tom @490, ah that's helpful, thank you. I had not realised that albedo changes had such substantial historic effects on past climates. I will read Hansen's paper. It is reassuring to know that we need to reach c 950 ppm before Antarctica warms by 10C above pre-industrial, because that's about 183 years away (assuming a linear 3 ppm annual rise in CO2) and human energy use will presumably have moved off fossil fuels sometime well before then. At least I hope so. Okay, I am a skeptic, but not foolhardy. There is no need to temp "Mother Nature", as that would be indeed very foolish. I follow some simple rules. First and foremost is to "Live simply so others may simply live". Hope that is not too offensive. I was in Newport RI, 36 years ago. I walking south along Ochre Point Ave looking for "The Breakers". To my left was a tall hedge row that was so dense that light could not be seen through it. I saw some people in a group not too far down the road. I suspected that maybe this was where I wanted to be. Sure enough, as I approached, I could tell there was a access point. My first view inside was to the right in a southerly direction and all I saw was vast open grassy field. I was not until I reached a point past the left of the entrance did the building to the left come into view. My first gut reaction was that I became nauseated. To this day, segments on TV, such as "Living Large", disgust me and I do not watch them. There is no reason that this "dwelling" should have existed as a home of a single family. For the same reason, I do not see why any CEO should make 1000 times more than his highest paid employee. Just a few years ago, I recall that a CEO received a total compensation equal to almost 3,700 times that of the companies managers and that year the business not only lost money, it would have gone bankrupt without a bailout. But, I digress. I have had hot air solar panels on my home since the time of Carter. I do not own a lawn mower, but when I did, it was a single "man" powered hand reel. I have since a abandoned the idea of have a lawn all together. When I had a lawn, all I can tell you is that it was "green", as I never applied fertilizer or weed killer and God watered it. I walk to Church on Sundays, every Sunday no matter what the weather. I only use the A/C when I have to, usually when we have company. I have replaced almost all of my incandescent light with CFL and I an now in the process of replacing the CFL with LED lights and am now using more than 90% less power than I did with the incandescent bulbs. We never waste food-ever. We walk whenever practical. I gave up golf long ago, because every round of golf requires 1,200 gallons of water. Water is second only to air when it comes to survival. Speaking of air, while college in 1967, I circulated a petition to have smoking banned from the cafeteria area, which if adopted, would have made the building smoke free, as the other area was the student lounge, which was smoke free. (My petition failed even though I had substantial support). That is my story. Think globally and act locally for the good of the planet. It is my guess that Earth will be my only home. Apparently, not everyone thinks the same as I do. If everyone is so sure the current spike in Global temperature is a direct result of human activity and for all intent it is "settled science", then why are we not doing something. The US imports or consumes an extra 350 million barrels of oil to produce an extra 6.5 billion gallons of gasoline that when burned produces 61 million metric tons of CO2. And how is this 6.5 billion gallons of fuel consumed here is the great wasteful US of A. IDLING! My proposals. #1. Idling will not be tolerated ever. Idling laws will be rigidly enforced and fines for idling will be so draconian that no one would even considering idling their vehicle. 2. Idler lose licenses. Period. 3. Remote starters totally illegal. 4. End of all drive through banking except for those who are disabled. 5. End of all fast food drive and all other drive through services. (accept for the disabled) You want to eat at Taco Bell, Burger King or McDonalds, etc., fine, park your car and walk inside. Proposal number two: Eliminate all organic garbage from landfills. Organic garbage in the US produces more than 10 % in terms of CO2 of all global warming gases as methane. Methane is 21 times more potent than CO2 as a greenhouse gas. Add to this the 400 million exta barrels of oil required to produce all the extra fuel to produce the estimated 31 million tons of food that is produced, transported, stored and then just dumped in the garbage. You might not believe it, but many household do not even own containers to store left overs. Everything goes into the garbage. Proposal three: Stop all cutting down of the rain forests. For all other tree farms, for every tree harvested for timber, three trees would have be planted. Proposal four: Limit car size and engine size. I could go on, but I know no one is really concerned about "global warming" otherwise we would be doing something NOW! RayfromNY, your proposals 1 & 4 would have neglible impact on emissions and seem unlikely to happen. We'll switch to electric vehicles long before such 'lifestyle' changes would ever be approved. Proposal two doesn't specify where all this organic garbage would go once you banned it from landfills... and would again have virtually no impact on global warming. I'm all for some variation of proposal three, though it would only be a stopgap measure. Why to take el Nino effect together with CO2 effect, is there any connection with El Ninios and CO2 levels in the past? El Nino and tectonic activity may be linked, effect of el Nino is definitely more influential then CO2 as trend is shorter with more effects. How to blame CO2 when there were periods in the past of the planet when it was warmer with lower CO2 level and colder with CO2 higher. Another question is: How to get reliable trend out of 200 years of observation, when this planet has trend of warming or cooling which lasts several hundreds thousands years. It may give short trends at the best but hardly indicate global planet trend in long time perspective. There are sometimes polar wortex - when good part of continent freezes for several weeks, anyone tried to link to global trends. NN1953VAN-CA, one thing you need to take into account in your reasoning: increasing CO2 in the atmosphere causes the climate system to warm. No paleo data is needed to confirm this. We have direct surface observations of the greenhouse effect (downwelling longwave radiation), and the physical mechanism has been established for well over a century. This is not about finding something to blame for the warming. The theory was established first. The warming was measured decades later. If CO2 concentration lags behind temperature raise for 800 ± 200 years than, when temperature starts dropping, CO2 still raises so temperature would not drop ever. Temperature drops eventually, what in that theory explains how CO2 concentration drops and what makes it drop. And on cooling cycle if CO2 lags, how higher CO2 level alows cooling, when it should be warming factor.That makes me think that CO2 is not as significant as it looks in GHG theory, there are more factors to take in calculation. Maybe physical mechanism established over a century ago needs some new aspect to warming. [PS] Please see the myth "positive feedback leads to runaway warming". The basics of feedback apply here and the effective CO2 feedback parameter is way less than 1. Rather than being century old science, ice age cycles are very active research areas. I strongly advice you at least read Chapter 5 of Ar5 to see latest work and understanding before leaping to unwarranted conclusions. The paleoclimate chapter in Ar4 is also a good index to key results and papers. The negative feedbacks associated with milankovich-induced ice sheet growth include: increased albedo, reduced production of wetland methane, and greater absorption of CO2 by cooling ocean. NN1953VAN-CA, where are you getting the 800 year figure? I suggest you read this post on the science of the lag. Real sceptics ask the question, "Are the changes in climate that have occurred since significant human CO2 emission fundamentally different from those that occurred before?". If yes, that would support the CAGW view. If not, CAGW *could* still be true, but the recent climate changes could not be cited as support for it except in a weak, probabalistic way. The problem is, for sceptics, that the support from the historical record has been repeatedly miserpresented and even falsified. Firstly, the Michael Mann's "hockeystick graph", given prominence in Al Gore's propaganda work, is still cited from tie to time in spite of having been debunked. It shows climate as virtually constant for a millenium before human CO2 and in doing so ignores important changes such as the Medieval Warming Period, the Little Ice age, as well as a noticable warming trend in the hundred years or so before human CO2 emissions. Other, more recent graphs are a good deal more honest about such things. However, the "trick" being used now is more subtle. 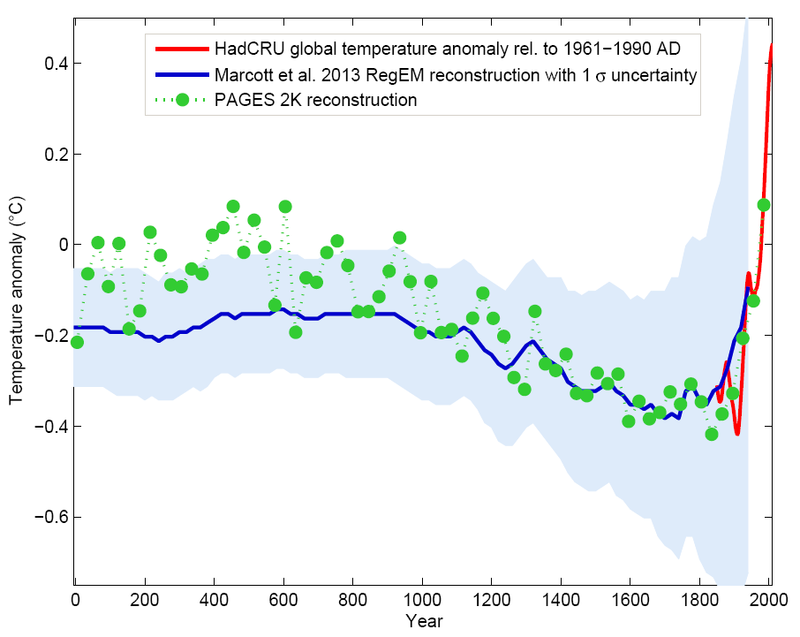 These graphs are, without exception, smoothed to a far greater degree during pre-CO2 periods than the recent period. For example, you will see 100-year smoothing up to 1950, followed by 10-year or even unsmoothed data. It should not surprise that the less-smoothed period is less smooth - and the more bumpt section looks more alarming! Graphs going back over many thousands of years are often even more heavily smoothed. I saw one recently that went back 400,000 years, meaning that it gave only 1 or 2 pixels to each 1000-year period, and yet the last 50-years was shown explicitly, with probably only 10-year smoothing. Now, if the underlying data has more resolution, then the correct way to show the data is with a shaded region between min and max values (so the fine variation may be seen), rather than a saeries of averages (which is just another way of hiding detail on shorter timescales). To be fair, many studies will be intrinsically unable to uncover that fine detail. But when presenting that data, the fact that past rapid changes will not be present should be honestly pointed out. Not kept quiet. Nearly every graph you now see of past trends is, whether by manipulation or limitations of the underlying study, not showing past rises of the kind seen in the last 50 years but only averages that would hide it. As a result, it would be incorrect to assume from them that such rises have not occurred. Suppose for example we see a cold day followed by a hot day. Someone micht claim that is an unprecidented event. Suppose they show you a graph of the last year's temperature, and smooth that graph out by taking weekly averages. Of course you won't see any examples of the event having happened before - the smoothing process rubbed them out! Alas, you seem to have tied yourself in a knot. Please go back to the issue, and think about it more carefully. This website's educational material is there to educate you ~ but you need to approach it calmly & logically. A Real Skeptic would know, having examined the issues, that Mann Bradley and Hughes 1999 (MBH99), aka, the Hockey Stick, has not been debunked despite strenuous efforts by McIntyre and McKittrick. Rather, McIntyre and McKittrick have used a statistical measure that calls a straight line plus white noise a Hockey Stick to argue that random noise generates Hockey Sticks in an attempt to debunk MBH99. "Many of the proxy records used in the reconstructions were generated some years ago and end before the year 2000. The reconstruction for North America, Asia and South America do not extend to the 21st century. The instrumental record shows that the last several decades have generally been warmer than previous decades. Therefore, the most recent 30-year period in our analysis (1971-2000) underestimates the actual temperature of the last 30 years." Finally, it is my instinctive reaction to treat "persuasive names" such as "A Real Skeptic Says" as indicating that the person choosing the name doesn't think their real skepcism will come across without their first telling us their presumed status. That instinctive reaction is rarely wrong. So rather than flagging the uncommon skepticism of the person involved, it tends to flag the opposite. Just a word to the wise.